Good quality oblong fiddle case is made of a high quality black woven cover with an interior of a red plush lining and integral covers. With the choice of the use of either a grab handle or carrying strap for ease of portability and locking clasps to ensure your instrument is well protected. 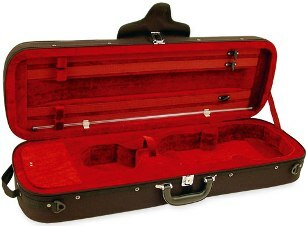 Complete with replacement covers and accessories pocket - an ideal case for all fiddlers.